Huge Savings Item! Free Shipping Included! 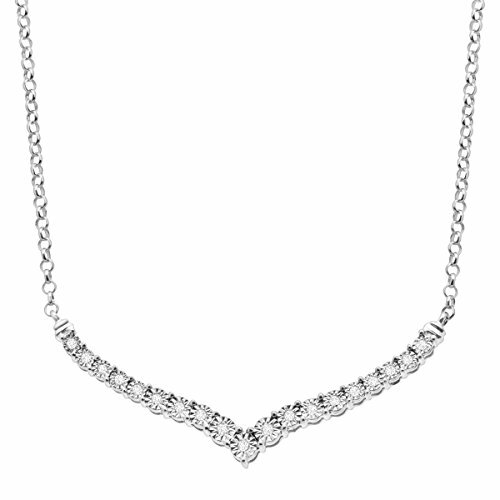 Save 15% on the 1/4 ct Diamond Chevron Necklace in Sterling Silver by Finecraft at Smart Silver Stacker. MPN: DICYNN3050SL. Hurry! Limited time offer. Offer valid only while supplies last. Stay on-trend with this modern chevron-inspired necklace! Round-cut diamonds, totaling 1/4 ct, are illusion-set in sterling silver for endless shine. Stay on-trend with this modern chevron-inspired necklace! Round-cut diamonds, totaling 1/4 ct, are illusion-set in sterling silver for endless shine. Feature piece measures 13/16 by 2 inches with a total length of 18 inches.